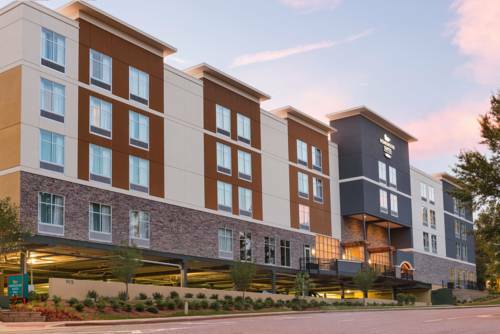 All of the modern studio and one-bedroom suites at this extended-stay hotel in Atlanta GA feature spacious living working and sleeping areas and are perfect for families small business meetings or extended stays. Every suite features a full kitchen which comes complete with a refrigerator dishwasher microwave utensils and cutlery. Relax on the comfy sleeper sofa and watch the flat-screen TV or check emails with complimentary internet access at the large work desk. Join us each morning for a complimentary hot full breakfast and meet friends and colleagues to relax over a complimentary evening social* Monday - Thursday. The 24-hour convenience mart stocks all the snacks drinks chilled meals and essentials you*ll need during your stay. For the ultimate convenience take advantage of our grocery delivery service. Explore Atlanta GA with our complimentary shuttle service which operates within a 3-mile radius. Dunwoody MARTA Station is easily accessible and connects directly to Hartsfield International Atlanta Airport. Work out in the contemporary fitness center and refresh in the heated indoor swimming pool. Stay connected with complimentary internet access throughout the hotel and make use of professional services in the 24-hour business center. Our modern meeting room is ideal for training sessions and small conferences. *State and local laws apply. Must be of legal drinking age. Reservations must be cancelled 24hrs prior to arrival local time to avoid penalty. Policy is subject to change.